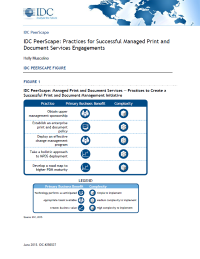 This IDC PeerScape study addresses how organizations can ensure ongoing success and also reach higher levels of print and document management (PDM) maturity. The growing prevalence of cloud-based applications, mobile devices and the increasing consumerization of IT brings new pain points related to document and information management. IT and procurement professionals, as well as line-of-business managers, have been looking to print and document management initiatives as a way to reduce costs, increase employee productivity, and better meet regulatory/compliance and environmental/sustainability goals.